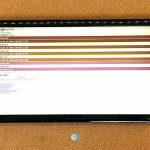 Part 1 of this tutorial will take you through the steps of building a Smart Picture Frame/Calendar that is connected to your Google account and will display a family calendar and family photos. 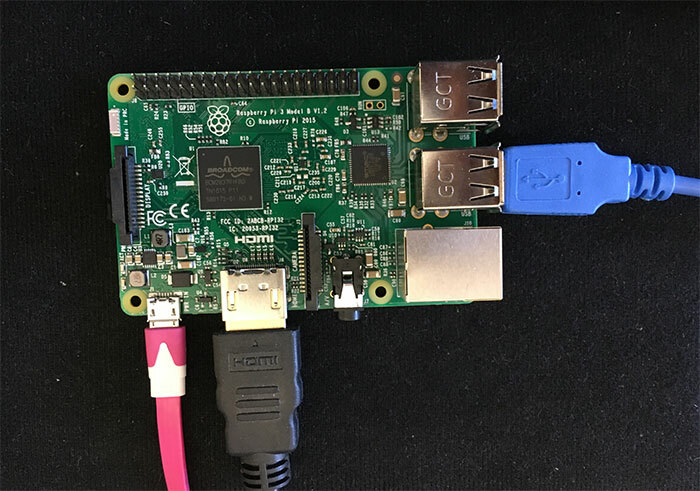 This project will be built using a Raspberry Pi 3 model B with the Raspbian Jessie operating system. 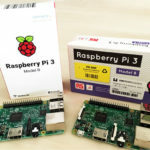 I’ll take you through the necessary steps to configure the Raspberry Pi (RPi) and install the additional software to make this project work. There are specific steps in every project to get from Concept to Deployment. Part 1 of this tutorial will get us to the Prototype phase. The next part will then go through testing and revisions till finally having a finished piece that’ll look great on any wall. 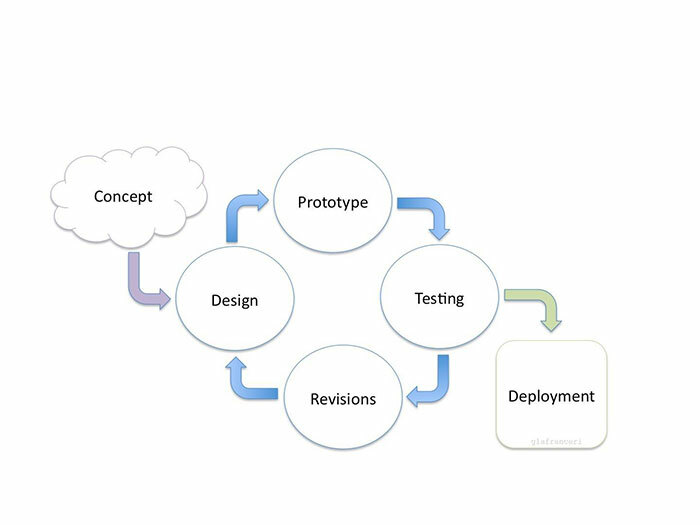 There are many steps in the development of a project from concept to deployment. You’ve experienced this: every morning, there is an impromptu meeting around the breakfast table to go over the daily schedule of who’s where, when, and at what time. This routine has turned into a hodgepodge of everyone putting reminders in their phones and writing on a whiteboard on the wall. I’ve had the idea to put a calendar above the whiteboard so we’d be able to see our weekly schedule. 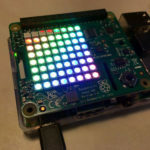 Why not make it a Smart Calendar with a Raspberry Pi (RPi) and monitor? And since the calendar doesn’t need to be seen all the time, why not integrate a Picture Frame slideshow into it, and show some family photos?! 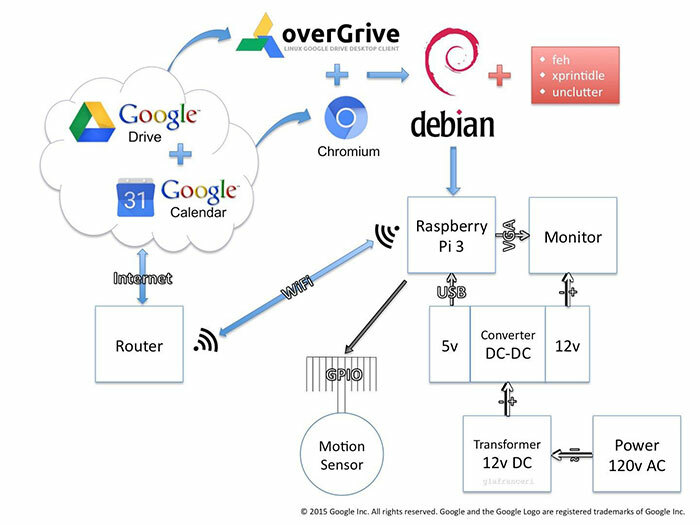 PART 1: Using Chromium, the RPi will boot into KIOSK mode and display a created Google Calendar. 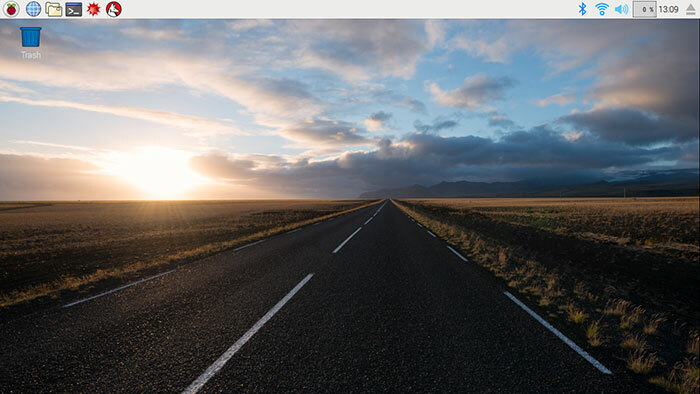 After a set amount of time a slideshow of images will launch in fullscreen over Chromium. These images will be downloaded and synced from Google Drive through an add-on program called overGrive. 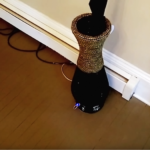 PART 2: Using a PIP motion sensor, a script will be programmed to switch between the slideshow and the calendar when someone is directly in front of the display. The whole project will then be mounted in a frame and wired up to look like a picture frame. 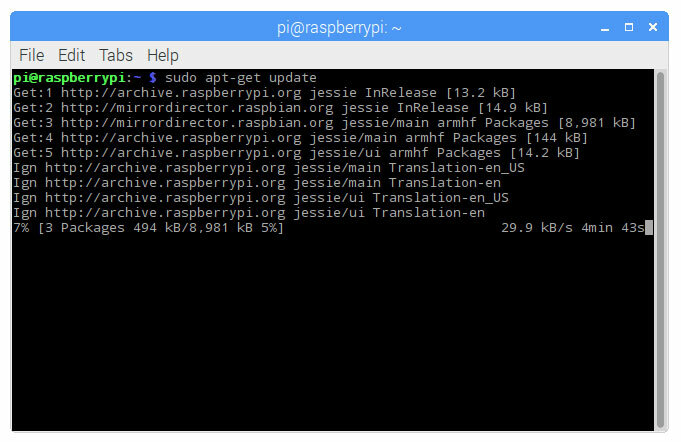 1) Download the “RASPBIAN JESSIE WITH PIXEL” Disk Image [ https://www.raspberrypi.org/downloads/raspbian/ ] and uncompress it to your hard drive. 2) Format a 8GB MicroSD Card. I use SD Formatter v4 [ https://www.sdcard.org/downloads/formatter_4/ ]. 3) Write the downloaded Disk Image to the microSD Card. I use Win32 Disk Imager [ https://sourceforge.net/projects/win32diskimager/ ]. 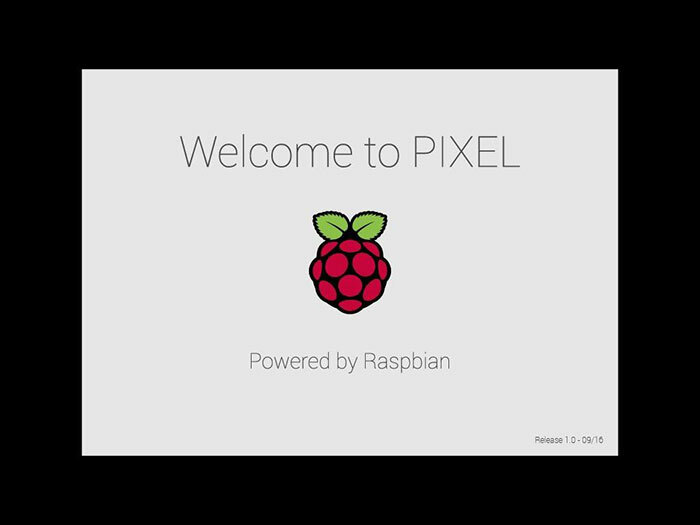 1) The Raspberry Pi (RPi) boots directly into Raspbian PIXEL GUI. 2) Click on the WiFi icon in the upper right of the menu bar to connect to you local router and the internet. 3) Change your RPi password by clicking on the RPi icon in the upper left of the menu bar and selecting Raspberry Pi Configuration under the Preferences menu item. 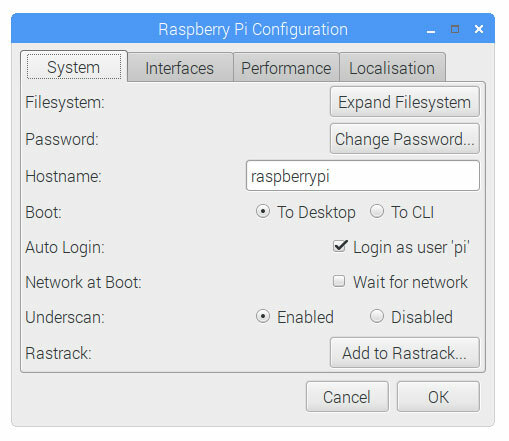 4) While your are in the Raspberry Pi (RPi) Configuration click on the Localization tab and configure the RPi to your area. 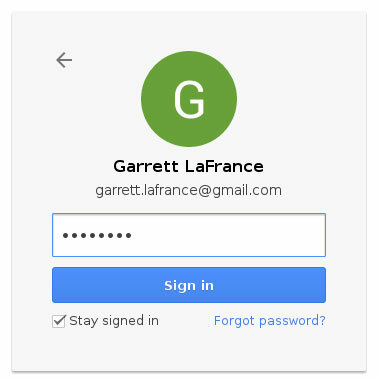 4) Sign in with your Google Account OR select [Create account], at the bottom of the page, if you don’t already have one. NOTE: Images for your slideshow should fit the monitor you are using. Consider images that are landscape over portrait to fit best. 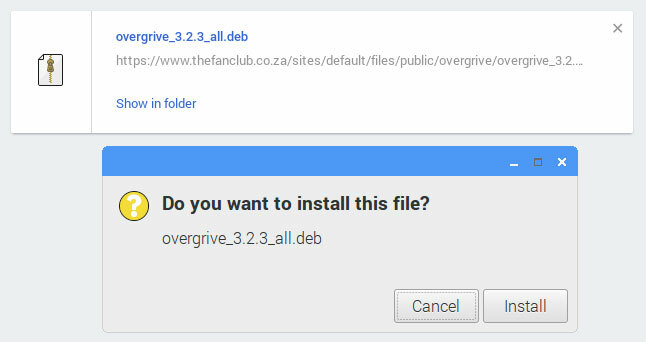 3) Type the following commands in to install the necessary program dependancies for overGrive. I. Click on [Accessories] and select the [overGrive] app. 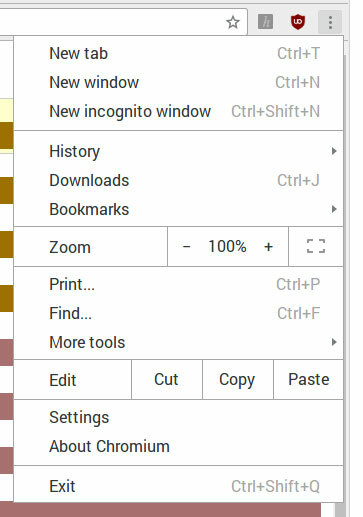 8) Click the [Change] button in the window and select the [Google_Drive] folder under the [Home] menu on the left. 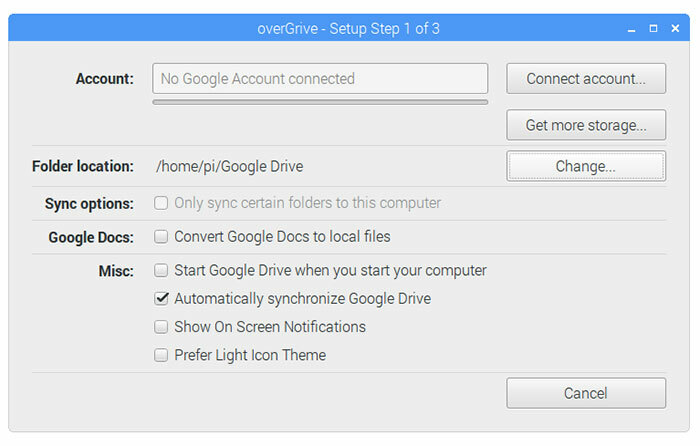 NOTE: overGrive is a polished Google Drive API solution. It costs a one-time fee of $ 4.99 to purchase a license and has a 14 day trial available if you want to test it out first. 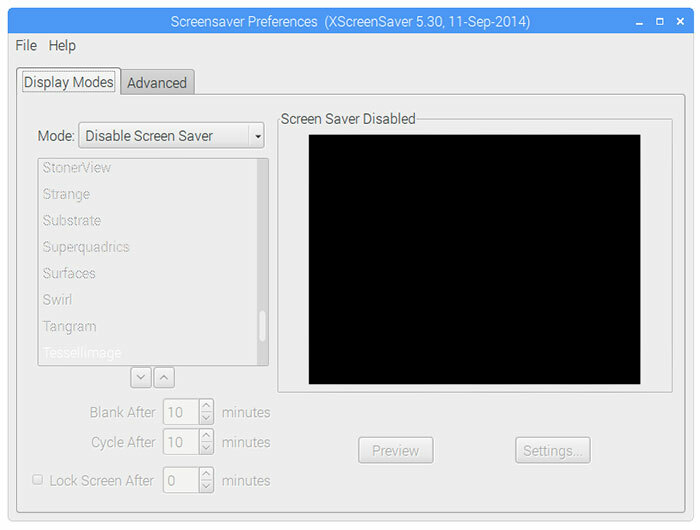 # screensaverfull.sh needs xprintidle and feh to work. # If argument empty, use 60 seconds as default. # If argument is not integer quit. echo "The Argument \"$1\" is not valid, not an integer"
II. Exit & Save by pressing [Ctrl] + [x], then [y] for Yes, and finally [Enter] to write the file. This project is off to a great start. 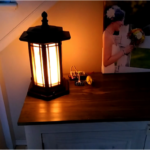 Part 1 was all about getting the Raspberry Pi configured and setup to display the calendar and load the slide show. 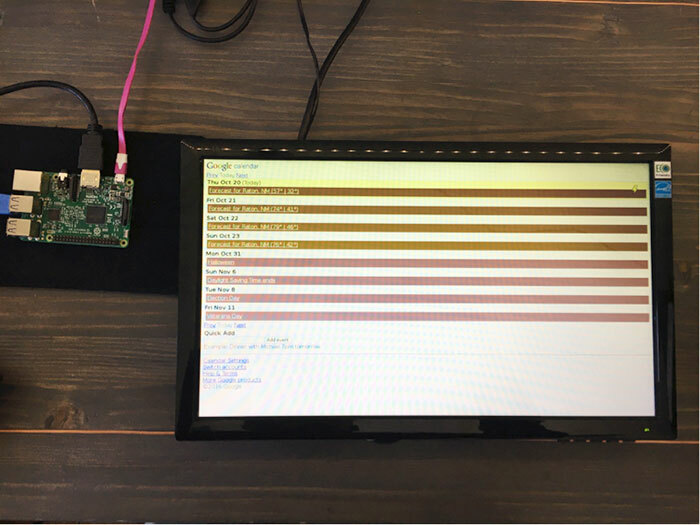 Part 2 is where we clean up the project: mount the Raspberry Pi behind the monitor, build a frame, and install the motion sensor. A technocrat with over 32 years experience in technology, computer sciences, and programming. Garrett professionally builds IoT prototypes, and believes understanding is the key to innovation.